In medium bowl, mix dressing ingredients. Cook and drain tortellini as directed on package. Rinse with cold water to cool; drain. 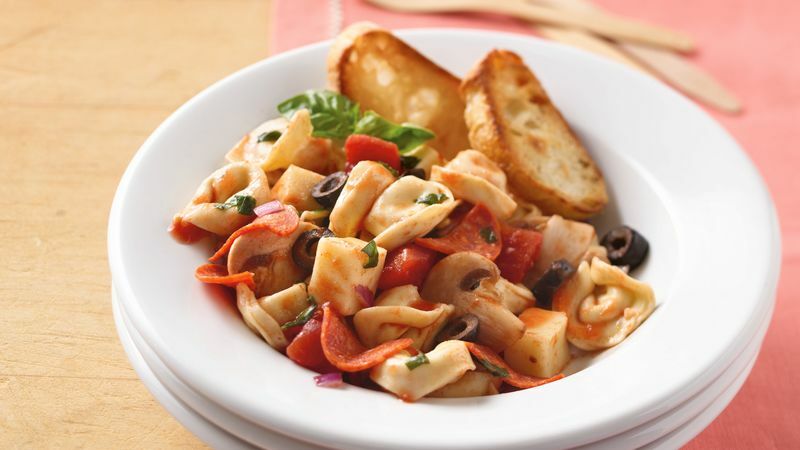 In large bowl, toss tortellini with dressing, mushrooms, cheese, onion, olives and pepperoni; stir in reserved tomato juice. Cover and refrigerate 1 to 4 hours before serving. Save time by substituting 1 container (16 oz) fresh bruschetta mix for the dressing. Look for this product in the deli or fresh pasta section of the supermarket. Consider serving this salad as a main dish. Complete the meal with a side of fresh steamed green beans and a crusty baguette.